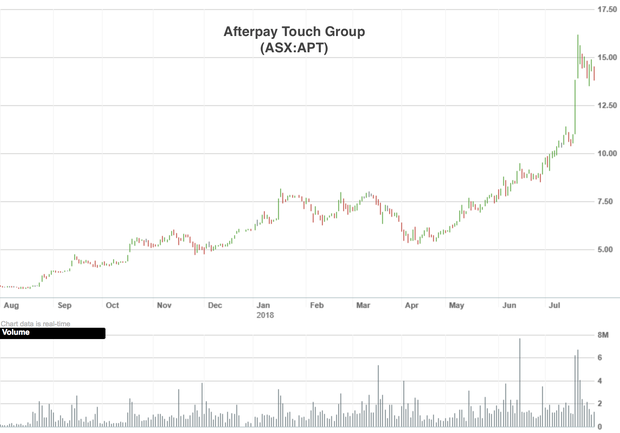 Afterpay Touch Group (ASX:APT) is leading the way in the ‘buy now, pay later’ space and has been nothing short of a gift for consumers and shareholders alike. Afterpay Touch gives shoppers the option to shop now and take immediate delivery, paying just 25% of the price upfront, while splitting the remainder into three equal interest-free repayments paid fortnightly — all the while delivering a boost to investors’ portfolios. Afterpay has convinced thousands of stores around the country to start accepting a new payment method, helping shift the way that consumers pay. APT makes its money by charging retailers a fee for its service of four to six percent, with APT taking all the credit risk. That means for a small fee, retailers get all the benefits of consumers upping their spending, meaning more revenues and more profits. Additionally, APT charges a late fee to consumers who miss paying their instalments on time. Late fees are capped at the higher of $10 or 25% of the order value, to a maximum late fee of $68 per order. It makes about 80 percent of its revenue from fees charged to merchants, and the remainder mainly from late payment fees from consumers. While APT isn’t the only operator in the space, it’s certainly the largest. Estimates suggest that Afterpay processes more than 10% of all physical online retail in Australia, while over 10% of Australian shopper have transacted with the service. It has an impressive 2.2 million customers and 16,500 retailers on its books and processed over $2.18 billion in underlying sales in the last financial year — an almost three-fold increase on the prior year. 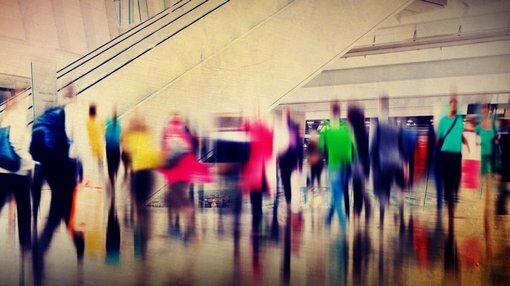 The platform’s growth is being driven by a combination of new customers, which are growing at an average of over 3600 people per day in the most recent quarter, repeat customer activity, as well as onboarding of new retailers (between 600 and 1000 new businesses per month), and an increasing share of retailer check-out. Of course, as with any stock, Afterpay is a speculative investment, so investor should seek professional financial advice if considering this stock for their portfolio. Afterpay’s rollout in Australia has been nothing short of exceptional, yet that’s nothing compared to what’s abroad. Building on its local market success, Afterpay has this year entered the lucrative US market. And it’s undoubtedly a huge market, seeing sales of more than US$3800 billion in 2017. Of this, over US$450 billion was purchased online, compared to the Australian online market of approximately US$18 billion. The company took the major step forward in May, launching its expansion into the US via a partnership with Urban Outfitters — one of the largest lifestyle fashion retailers in the US. Since then further US partnerships have been formed. All up, in a few short months APT has signed over 400 retailer contracts to date and has more than 200 retailers transacting on the platform. In the first full month of operating in the US — June 2018 — the company processed over $11 million in underlying sales. By comparison, it took approximately 16 months for the Australian Afterpay business to hit $11 million of cumulative underlying sales, so clearly there is significant potential on offer abroad, and in the US in particular. No longer flying under the radar, APT was been added to the S&P/ASX 200 Index in June — a move that should see fund managers increasingly add the stock to portfolio when it comes time to rebalance. The question now is whether the company can continue to grow and with it, whether it will continue delivering to shareholders? There are certainly some optimistic views out there. Take Bell Potter for example. After APT’s most recent business update, the broker lifted its target price on the stock from $10.41 up to $21.00 — still well above the current $14.03 even after the stock’s recent rally. Although, it should be noted that broker projections and price targets are only estimates and may not be met. Those considering this stock should seek independent financial advice. Yet while shopper and merchant numbers continue to rise — the international expansion being a significant driver — the company certainly isn’t risk free. A drop in consumer confidence and retail spending, as well as the rise of competitors and new entrants are clear business risks. However, maybe a more concerning risk is future legislative changes. Right now Afterpay operates outside of consumer credit laws as it doesn’t charge any interest. The company is essentially taking advantage of a loophole in the national credit laws. The industry remains essentially unregulated. Yet it’s only a matter of time before this changes. In fact, the Treasury Department last month released draft legislation to bring unregulated short term credit, including ‘buy now, pay later’ providers, under the regulation of ASIC. The legislation is now going through public consultation, so changes may not be far off. The introduction of this type of legislation could certainly have detrimental impacts on the business model. However, news of the draft legislation attracted little attention — although it was likely overshadowed by the upbeat business update released the prior day. More should be revealed shortly with Afterpay planning to publish its audited financial results and annual report on 23 August 2018. At this stage APT expects Group Revenue and Other Income for the year to be in the order of $142 million, with before-tax earnings (EBITDA) in the order of $33-$34 million, prior to one-off and share based expenses but including the majority of expenses incurred in establishing and operating the US business.